We have done lots of work, but we still have plenty of things to do. For now, we can already announce that we have the definitive venue and dates for the festival. And yes, I guess we can also announce a new huge newness for this year: the Barcelona Beer Challenge. "Today, terms like "craft" are not sufficient to position the quality of the product"
Dates: Friday 4th, Saturday 5th and Sunday 6th of March 2016. Venue: Museu Marítim de Barcelona (Maritime Museum of Barcelona). 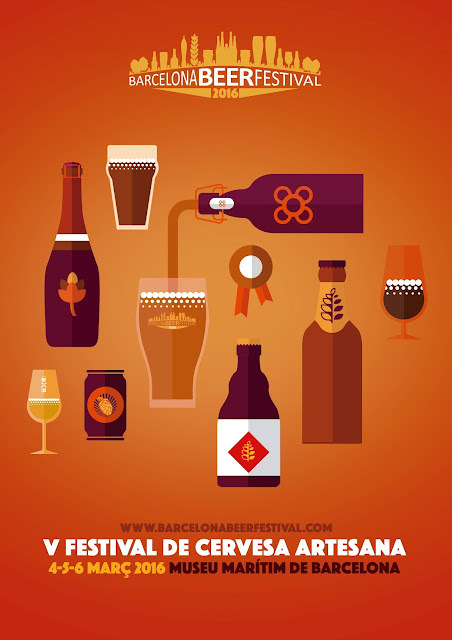 Official poster for the Barcelona Beer Festival 2016. We feel very comfortable working in a place like the Marqués de Comillas Hall of the Maritime Museum of the city, which offers the necessary facilities to successfully develop our idea for the Festival. So we are back in the museum, this time during the first weekend of March. To promote quality in the beer industry, awarding a prestigious prize to those beers that meet high standards. To generate a context where breweries from all over the state come to compete, not only among themselves, but also with other international brewers. To promote the internationalization of local beer creations. To promote education and knowledge of quality beer to end consumers, while fostering a culture of responsible beer consumption. Today, many consumers are aware that terms like "craft", "artisanal" or "premium" are not sufficient to position the quality of a product quality. That's why the BBF team wants to highlight the value of those beers that meet a high standard of quality. To this end, we will have a professional jury, as well as a procedure designed to ensure a fair issue of the stamp of quality that the medals awarded in the contest will represent. We are four months apart from meeting again to spend a good time drinking some beer. For now, we will keep on working to make sure that all of our visitors keep your smile on your faces throughout the whole weekend of the Festival. Barcelona Beer Festival Official Website. Barcelona Beer Challenge Official Website.